The other day I made this card with embossing paste and a stencil I made with Window Sheet and the Detailed Floral Thinlit. I made a black and white panel at the same time which I've used in today's card. I added the Basic Gray stripes to the Powder Pink layer by temporarily adhering little strips of cardstock to the panel as a mask and sponging with Basic Gray ink. I added a small piece of Basic Gray cardstock under the pink and grey panel to put a full stop under that section. The card base is made with Whisper White Thick A4 cardstock. 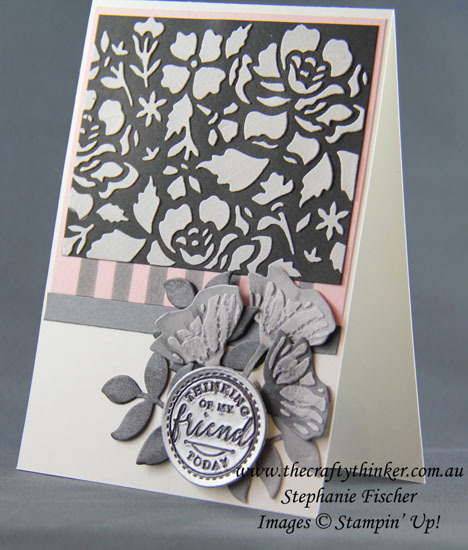 I stamped the flowers and foliage from the Oh So Eclectic stamp set with Basic Gray ink onto a mix of Basic Gray and Smoky Slate cardstock pieces and cut them out with the matching Eclectic Layers Thinlits (buy as a bundle to save 10%). I had already created a mask for the flowers for this card and used it again with embossing paste coloured with a drop of Smoky Slate ink. When the embossing paste was dry, I added some shading by watercolouring with Memento Tuxedo Black ink. To create the faux metallic medallion, I added four layers of silver heat embossing to a small piece of cardstock. Before I heated the fifth (and final) layer, I inked up the stamp with Basic Black ink. 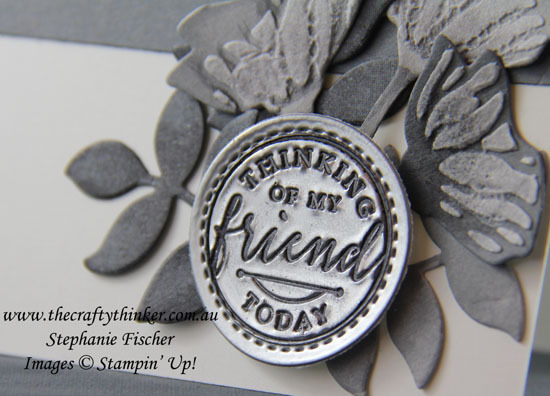 While the silver embossing was still warm and soft, I stamped the greeting. 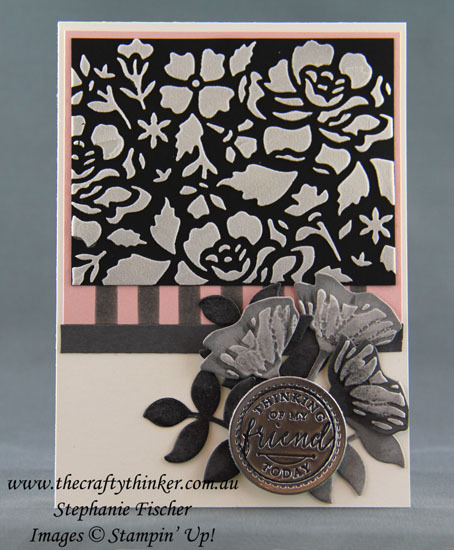 Once it was cool, I cut out with one of the Stitched Shapes framelits and added it to the card front with Stampin' Dimensionals. I had some flowers and foliage left over, which I used on the card that I'll share on tomorrow's post.